The Argon's athletic fit and performance fabric redefines the typical scrub pant. With a mid-rise and a reinforced waistband, it'll stay put even if you're bending down. Clean vertical lines extending down the front of the leg create a strong slimming effect. 2-way stretch scrub fabric that's antimicrobial, odor-free and shrink-free. Signature Element drawcord with really cool silicone tips. A reinforced, ribbed elastic waistband without excessive ruching and bunched fabric. It's super comfortable overall and I really like the modern look that it has. A clinical approach to new fabric and zero compromise attitude coupled with an iterative and relentless technical process with 100s of trials, allowed us to bring the ultimate stretch scrub fabric to you. Magnificently soft and durable with enough structure to keep you looking professional. The only 2-way stretch scrub fabric with the highest possible test rating in the industry...we've tested them all. That's why we back our stretch scrub fabric with our one year warranty. Allow us the opportunity to display your name and title - embroidered with prestige and perfection - in the manner you've earned. Our in-house service allows us to provide exemplary service to our customers and colleagues. We go to great lengths to ensure that each garment is perfectly sewn, inspected, and packaged. We are committed to working with you until you are 100% satisfied with your embroidery. Logos are sewn directly onto garment—no patches. Depending on the logo, name & title embroidery may be sewn in a matching color. The one-time $150 digitization of your logo file takes 5 business days. Once completed, you’ll receive an emailed picture for your approval. Up to 3 total adjustments can be made—beyond 3, an additional $50 fee applies. Once approved, garments are scheduled for embroidery. Pre-treat Stains. See Stain Removal for product recommendations on removing specific types of stains. Tumble dry low–medium heat, no dryer sheets. If laundering, ask for no starch. 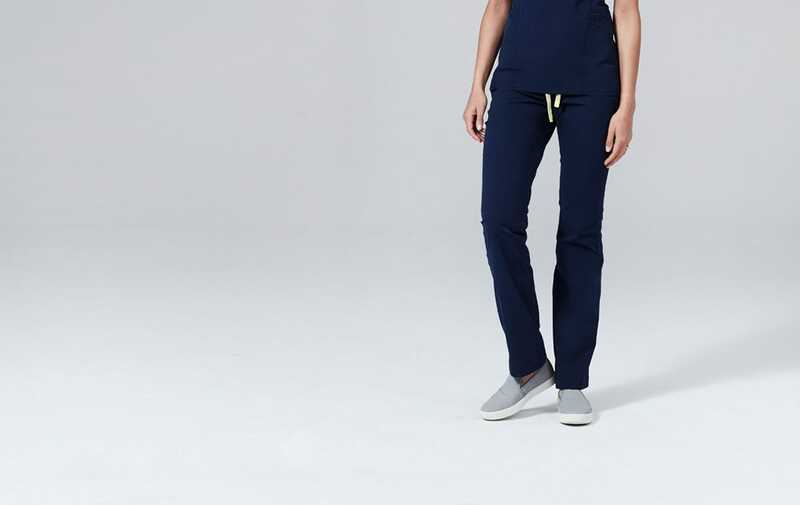 Using contouring seams and groundbreaking fabrics, this athletic fit redefines the typical scrub pant. Combining fashion with function, it'll keep you stylish and comfortable on your busiest days. I absolutely love my new scrubs and can't wait to wear them. The scrubs are amazing quality and the little details make all the difference. I love the feel of the fabric, which is like a cooling athletic fabric. The only thing I would wish for is longer pants...I hope Medelita makes a tall pant soon! I love the argon pants! The yoga waistband is so comfy and soft and the drawstrings are cute but also totally functional. I also love the hidden phone pocket, the scissor loop, and accents in yellow/lime green. The Argon pants I purchased from Medelita are truly the best scrub pants I have ever owned. The fabric feels like athletic wear and the waistband is wide and comfortable like yoga pants! I love that the waist also has a real drawstring closure and elastic so that you can adjust them to the best fit. The details like the lime green zippers and the silicone finish on the vibrant drawstring are a fun bonus! Also, I love that there are TONS of pockets! Even a hidden one for your phone inside the bigger pickets that even fit your stethoscope. Thanks Medelita! I’m going to change over all of my scrubs. As a veterinarian, I particularly like the argon scrubs for their ability to repel pet hair (I'm sure this wasn't part of their intended design, but it works great for those of us in animal medicine fields). Not to mention the fact that they're some of the most flattering scrubs I own and are beyond comfortable. I recently ordered several pairs for a new job that has scrub color requirements, and one of the pairs I received wasn't made from the same fabric I have grown to know and love in the argons. Medelita was quick to answer my query regarding fabric and even quicker to send me out a replacement pair, at no cost to me. Will continue ordering and recommending their scrubs to everyone I know that is lucky enough to wear scrubs to work! Excellent purchase, it fits perfect to me, amazing fabric, for sure I will buy again in Medelita. I would actually give these a 4.5. I am 5'4", pear shaped, and weigh 127 lbs. The size small fits exactly the way I wanted it to: fitted with room to stretch. Could only be improved by 1-2 additional pockets. I love the material of these scrubs and I only wish they made more styles because I would buy them all. Don’t hesitate to purchase these scrubs. These pants are so comfortable! They never lose their shape during long shifts. They look professional and the colors never fade after being washed. These are my go-to scrub pants. Q: What is the inseam length on these? A: Hi Kaitlin, thank you for taking the time to write us a question. The inseam on the Argon and Delta's from XXS-XXL is 32 inches.